GALION — It has been a building process for head coach Tom Pawsey and the Galion Tigers boys tennis team. Through all of the hardships that the program has faced, the 2017 season provided the first winning season since back in 2003. That squad, then coached by Linda Gage and featured players Kevin Dawson and Ethan and Matt Monk, finished the season with a 13-4 overall record. In 2017, Galion finished with an overall record of 12-8 and a final eight appearance in the Ohio Tennis Coaches Association tournament before being ousted by the squad from Wauseon. At their recent banquet, the players were award with their varsity letters and “G-trophies” in various categories. Earning their four-year varsity letters and team captains pins were Nic Oehler and Landon Rose. Oehler also took home the trophy for “Mr. Tennis” alongside first-doubles partner Matt Sparks and both were named to the North Central Ohio Media Group and Spreng Capital Management All-County All-Star team. Rose was also awarded with the coaches award trophy. Lucas Conner earned his third-year varsity award and also took home a 2017 coaches award “G-trophy”. Bryce Barnhart, Tyler Harris, Max Papenhausen and Matt Sparks earned two-year varsity awards on the evening. Barnhart and Harris earned a “G-trophy” for most improved while Harris was also named to the All-County team. Papenhausen was also a County All-Star and clinched the trophy for most wins on the team. Earning their first-year varsity letter in tennis were Jared Dixon, Alec Dicus, Luke Eisnaugle and Weston Rose. Dixon took home the “G-trophy” for being the tops on the team in academics. Chad Clinger | Galion Inquirer Galion’s first singles team of Nic Oehler and Matt Sparks in action against Crestline earlier in the 2017 season. 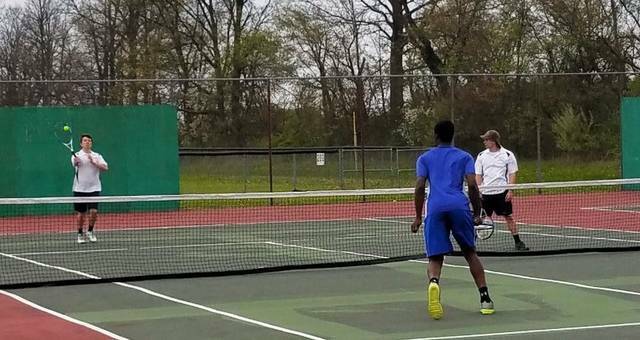 http://aimmedianetwork.com/wp-content/uploads/sites/38/2017/06/web1_first-singles.jpgChad Clinger | Galion Inquirer Galion’s first singles team of Nic Oehler and Matt Sparks in action against Crestline earlier in the 2017 season.